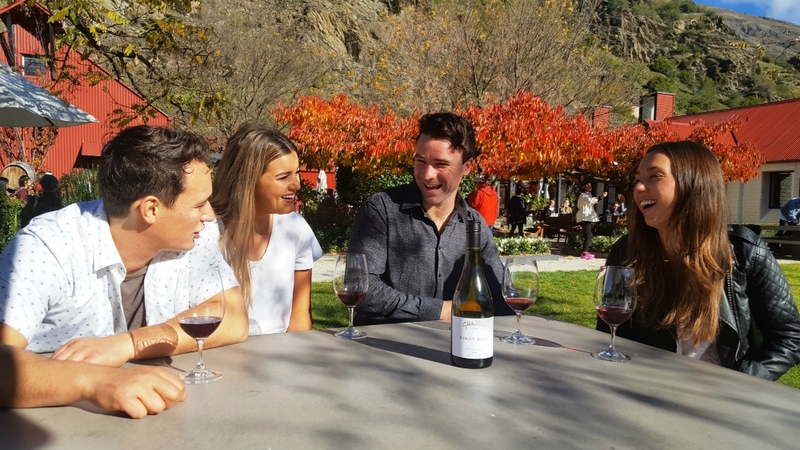 Queenstown Wine Trail offers personalised tours with knowledgeable and experienced wine guides, ensuring that guests have fun and enjoy a premier wine tasting experience. Travelling time is kept to a minimum between wineries with the emphasis firmly on indulgence - in world class wines, locally made tasty cheeses, an optional scrumptious winery lunch, and unwinding among stunning South Island scenery. The variety of tours at Queenstown Wine Trail means that everyone is catered for, whether you're a honeymooning couple, a multi-generational family on holiday, or a solo traveler - you will be part of a small but friendly group, tasting award-winning wines, learning about what makes Central Otago wineries so revered worldwide and relaxing in the spectacular vineyard region of New Zealand. Queenstown Wine Trail operate small group tours with morning or early afternoon departures. The Original Tour operates year round and takes in a full afternoon of wine tasting visiting 3 wineries and an underground wine cave tour. The Food & Wine Tour also includes a wine & food paired lunch. Bannockburn's Finest full day tour visits 5 Central Otago wineries with a winery lunch or wine & food paired lunch. Price includes accommodation pick ups from selected Queenstown accommodation. Those seeking exclusivity and more control over their itinerary might want to opt for a private wine tour. It is possible to choose which wineries you visit, sightsee around Arrowtown or further out into the Central Otago / Bannockburn wine region. Eat a sumptuous A la Carte lunch or enjoy an evening experience including 'trust the chef' at Amisfield Bistro and of course, taste some award-winning wines. There are so many activities in Queenstown that you might be finding it hard to fit it all in. Queenstown Wine Trail offers combo options with helicopters, jet boats, day spas and walking. This way you can combine the thrill of adventure or the relaxation of pampering, along with your visit to world-class wineries.